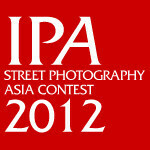 The 2nd Annual IPA Street Photography Asia Contest by Invisible Photographer Asia (IPA) is now open for submissions till 1st June 2012. The 2nd edition of the IPA Street Photography Contest will soon open for submissions. Meanwhile, here is the 1st Prize up for grabs, proudly sponsored by BenPhoto Singapore and Chiif Cameras.